My PlayStation 3 gets used on an almost daily basis but, surprisingly, not usually for gaming. Instead, the PS3 sits at the center of my home media setup, permanently plugged into my High Definition TV, giving me access to photos, DivX files, video podcasts and music streamed from an iMac in the room next door, along with the ability to play movies on Blu-ray and browser-based video from YouTube and the BBC’s UK-only iPlayer. To get the Mac to talk to the PlayStation I’ve been using Nullriver’s solution, MediaLink, which, aside from occasionally needing to restart the application, has worked a treat. At the time I purchased MediaLink it was the only viable solution (Elgato’s EyeConnect, by the company’s own admission, wasn’t really up to the job). However, as of this week, Nullriver has some competition. 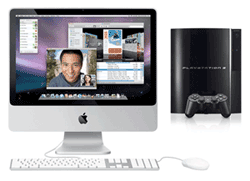 Cynical Peak Software have updated their Mac to XBox 360 offering with support for the PS3. Called Rivet 2.0, the software enables users to browse and stream media from any folder on their Mac from their PS3, with support for all file types that Sony’s games console supports, including AAC, MP3, WMA, H.264 and DivX (AVI). Although I haven’t had a chance to test Rivet yet (I’ll try and source a review copy), one feature that the software supports, which MediaLink lacks, is the ability to limit access to specific DNLA-certified devices — the media sharing protocol that the PS3 uses — without which, any supported device that sits on the same local network can access the media that’s being shared. To achieve this, Rivet enables filtering by IP address.